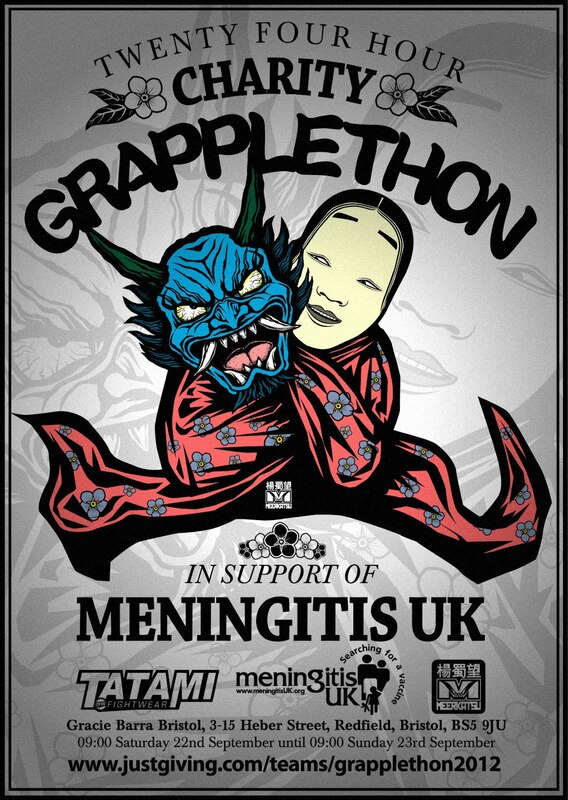 The GrappleThon is THIS WEEKEND! It will be streaming LIVE from 9am British Summer Time on the 22nd September (i.e., this Saturday). Meerkatsu, me, GB Bristol and a few friends from other clubs will be rolling around in front of the camera, so you'll get to watch us getting steadily more knackered (or possibly hyped up on energy drinks...) I'll be sticking up more details in my Thursday post, as that will be the last post before the GrappleThon (though I'll also back-date a review I'm about to post too, as the GrappleThon will be a good test of the product in question ;D). After the tight focus of the previous fortnight on the triangle, the current fortnight on guard passing has been a bit more open, with several different guards in the mix. Tonight, Dónal was looking at a classic guard pass, the knee cut. At the point we join the technique, the guard is already open. Put one knee up, placing your same side hand on their same side hip. Your other hand pushes into their other knee, shoving it to the floor. Slide your raised knee diagonally over the thigh of their leg you just shoved to the mat. Once you're able to press your knee into the mat (if there is any space, they may be able to wedge an elbow underneath and mess up your pass), you can switch the hand that was pressing into their knee to instead grab their same side arm, either by the sleeve of the tricep. Dónal split the technique at this point, making sure everybody had a chance to drill that entry. He then progressed to the finish. Your first hand, which was earlier blocking their route to your back, will now also slide forward, looking to get a deep underhook past their same side armpit. Slide your knee forwards, until you reach their upper body. Their sleeve/tricep arm should be held firmly, while your underhooking hand can now reach all the way to their shoulder and grab securely. From here, you can yank them towards you with your underhook. Getting a deeper grip that gets to the shoulder rather than just controlling their arm results in a far more powerful pull. You're then going to step over their head, keeping their arm pinned to you, swivelling into an arm bar. This will be the 'Japanese armbar' position, with one leg over their head and the other foot tucked by their side, so you'll need to also grab their trouser leg. If you don't have that leg, you're vulnerable to the hitchhiker escape. You also want to pinch your knees together. There was enough time for several rounds of sparring, which went much the same way for me each time. I kept finding myself either in a sort of open guard or closed guard. I am over-focusing on looking for submissions from closed guard at the moment, so need to remember about sweeps too: perhaps the Rey Diogo sweep off Andre Anderson's DVD. The main submission I've been trying is that deep grip collar choke. I'm able to get in the super-deep grip, but I think my second grip is too loose at present (apparently you don't need a very deep second grip for this variation, but clearly it still needs to be tighter than the one I'm currently getting). I also tried to get a triangle from the overhook guard/arm-wrap position, but I didn't deal with the stack properly. I got into that classic small-person situation of legs around that back with one of their arms in, but completely squashed so unable to get any angle. I should have been shoulder walking back, and I also should have maintained better head control. I switched to grabbing my shin at one point to adjust, but that wasn't enough to stop them from posturing up. With Tony I played around with the gi, pulling out his lapel then pressing into it with my feet. I wanted to see if I could get any control that way and disrupt his base, but the position he got into seemed to negate it. I'd like to do more with the gi tail, given that I almost never train nogi, so it would be good to take more advantage of all that cloth.